“Give it a try.” Terry, one of Bear Roots Brewing Company’s co-owners said, pushing a taster glass of a dark brew towards me. I was getting a personal preview of Bear Heart, the brewery’s first barrel aged scotch ale. Aged in Jack Daniels whiskey barrels, Terry was nice enough to uncork one of the wooden kegs and let me join him to gauge the beer’s progress. Despite still not being at full maturity the beer still packed a mouthful of flavor. Dark and malty with hints of fruit and caramel I got that bite of whiskey flavor as I finished. Looking down the long wooden bar I loved the Bear Roots esthetic; rustic and homey the small brewery gave off a woodsy cabin vibe. Reclaimed paneled walls with green mossy accents and a hand carved wooden bear were all part of the scenery. 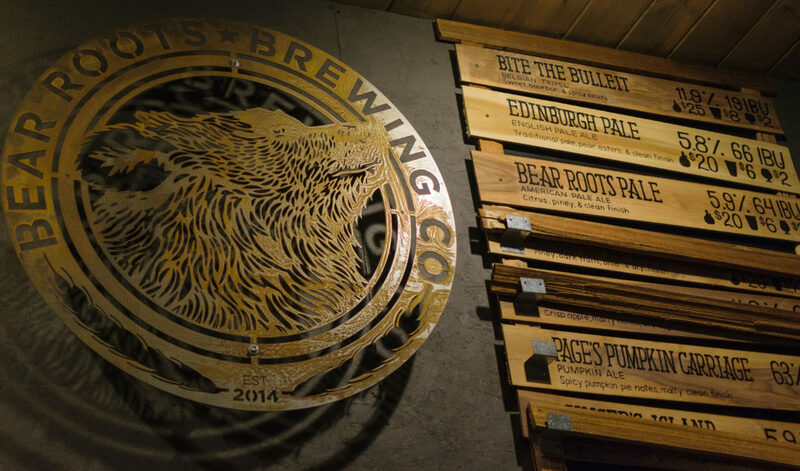 “This is California, after all.” Terry said, “So we went with the bear.” He gestured up towards the Bear Roots logo, a grizzly encircled in the brewery’s name. Terry’s vision and Bear Root’s mission was to be a brewery by and for the community. Like many craft brewers he started brewing in his garage and through a lot of hard work and passion he was able to realize the dream of owning and operating his own brewery. He wanted to be an inspiration, a resource, and a starting off point for other local people looking to explore the craft. 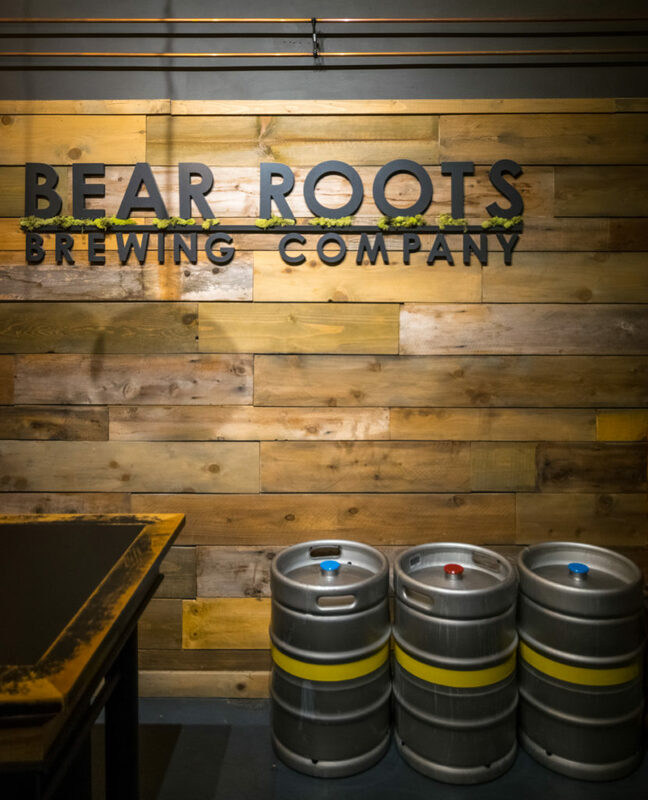 With this in mind Bear Roots devoted part of its floor space to provide everything necessary for the burgeoning home brewer to get started. Small aisles of malt, hops, and other ingredients as well as growlers, tubes, and fermenting equipment were all available for purchase. A fan of dark beer I ordered up a taster of Bear Cookie, a signature stout and according to Terry one of the brewery’s best sellers. Smelling of chocolate, and roasted coffee, I brought the taster to my lips and was hit with a flavor that was essentially a cookie in a glass. A mix of mocha, vanilla, chocolate and peanut butter combined with a sweet hint of Noble hops to finish. The perfect after dinner beer. Mixing things up and at Terry’s recommendation I tried Bear Root’s Imperial IPA, Deep Rooted. It was spicy with notes of melon and complex citrus. Dry hopped, it had a crisp and refreshing texture. The flavors hit hard, a welcome reminder that I was indeed in Southern California, IPA country. In addition to being a market place for the average home brewer Terry began detailing the brewery’s other ventures into inspiring the local craft beer community. 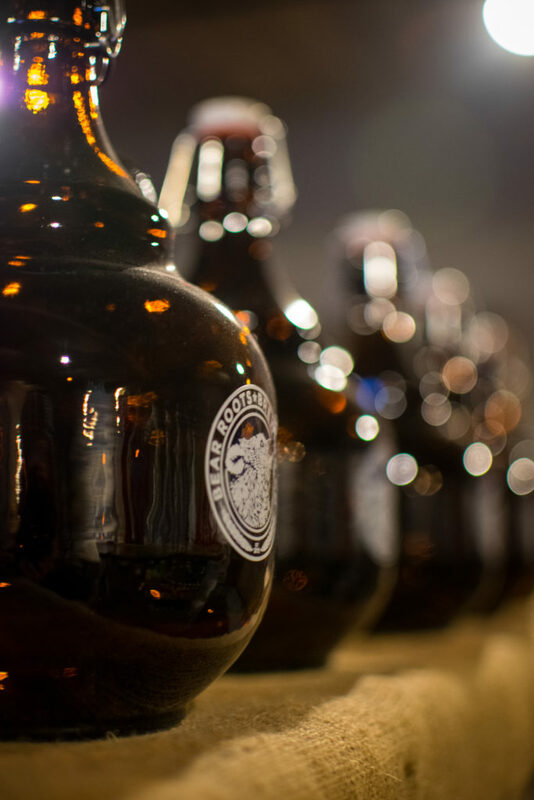 The Brew On Premise program allows up to three people to come into the brewery for six hours and tutored by one of Bear Roots master brewers learn to create their very own custom brew. After the beer is finished the party is welcomed back to the brewery for a special unveiling. Whether this event is private or open to the public is totally up to the creator. The party is able to take a keg home with them and in addition half of the sales of the beer from the brewery are donated to the creator’s local charity of choice. I found Terry’s enthusiasm and passion for his neighborhood inspiring. Spending an evening in Bear Root’s warm and welcoming atmosphere made me wish I was a San Diego local. Watching as Terry got up to shake hands and say goodbye to another local brewery owner I was envious that I couldn’t stop into Bear Roots regularly. Bear Roots and its staff had truly created a space to inspire and support the passionate and curious. It helped that they also churned out delicious pints of beer. It was definitely the type of community you wanted to be a part of. Gathering my things to leave I caught the sound of music. Come Together by the Beatles played overhead.